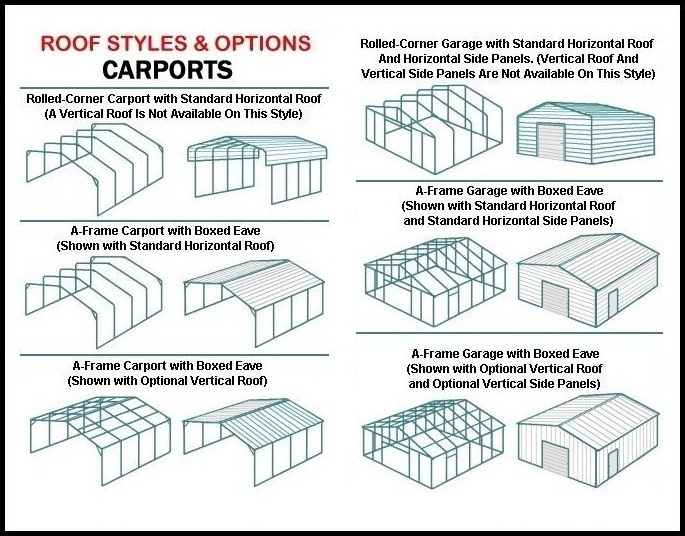 New Deal Metal Buildings has years of experience with designing carport kits for either your vehicle or RV camper. The critical measurements are the width, length, and the overhead clearance required inside the metal carport building. In addition to these measurements, you should also consider any exposure to extreme weather. 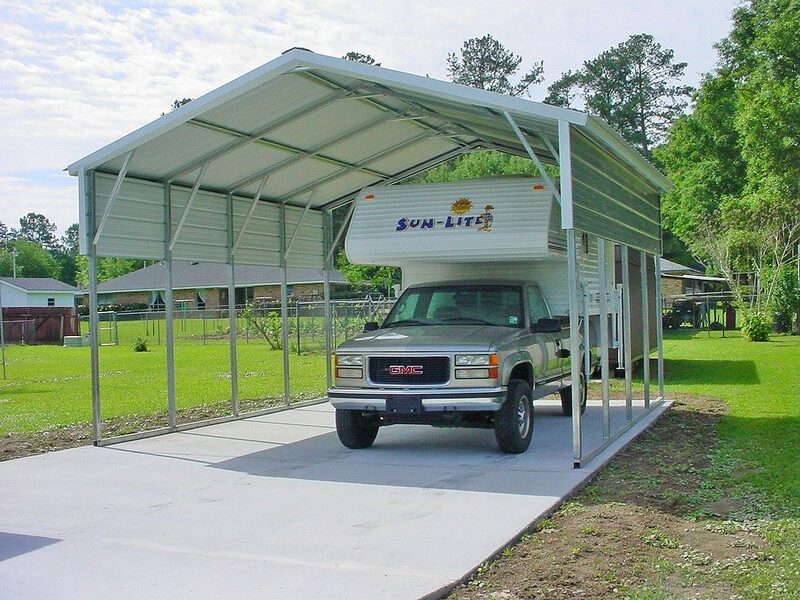 For instance our metal carport designs are perfect for blocking ultra violet rays that can cause severe fading of a motorhome’s paint finish that is parked for extended periods of time. To prevent this from occurring you may want to shield that side with an additional metal panel that will protect that particular area. Another thing to consider is the fact that you may want to leave your R.V. slide-out open while parked inside your metal RV carports. In this case make sure you consider the necessary distance needed to comfortably fit either the fifth-wheel or travel trailer inside and be able to open the door and steps being careful not to bump the steel carport’s upright poles. If it’s difficult to back your camper into the metal carport building because of turning radius constraints, then always consider adding extra width inside the steel structure. Keep in mind the main area of your recreational vehicle that requires protection is the roof. The rubber materials that manufacturers use tend to really take a beating from the weather. Inclement weather such as rain, snow, and especially UV rays from the sun will take their toll over time. These are the big three things to be aware of and no better way to mitigate these damaging effects than to have a durable metal RV carports cover installed by a factory trained carport crew. Step 2: How much do I plan on spending? Step 3: What surface is it going on, ground, concrete, other? Step 4: Will I have to get a building permit? Step 5: Does the building meet or exceed wind/snow loads? 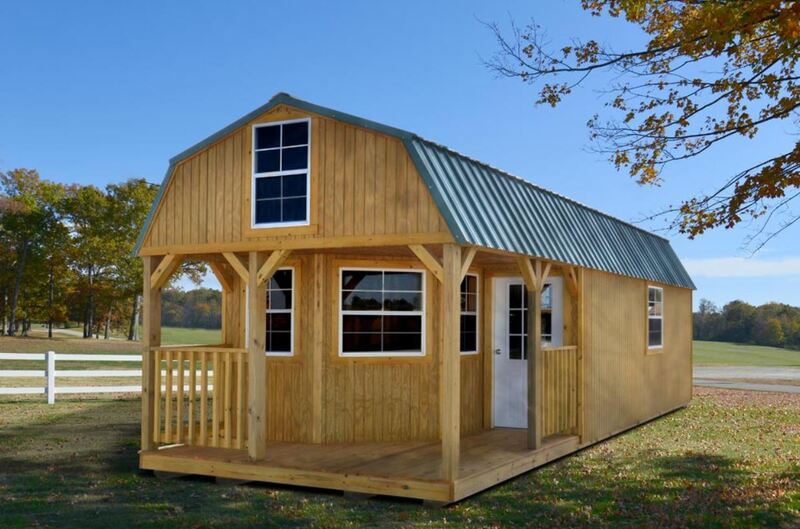 Dersen Portable Buildings are constructed using the finest materials. The 2×4 reinforced doors are designed to seal out rain and are key locked for your protection. Pressure treated buildings are water sealed at no extra cost. Pressure treated buildings are built with quality 5/8”T1-11 siding, which comes with a manufacturer’s limited lifetime warranty. Painted buildings are built with LP SmartSide technology, which comes with a 50 year Manufacturer’s warranty. All pressure treated wood has a limited lifetime warranty against termites and fungal decay. All buildings roofed with either 30 year metal roofing or 30 year architectural shingles, both with manufacturer’s warranty. Your choice, same price! Floors are built with 5/8” floor decking. Floor joists are 2×6’s not (2×4’s), and set into notched skids for maximum strength and durability. Floor joists are set on 16” centers (10’ wide and larger) and are 12” center on ALL garages for maximum strength and durability. Wall studs are 24” on center and doubled under siding seams for added strength and stability. Double studs at seams offer same strength as 16” on center building, while adding DOUBLE strength where siding attaches. All Derksen buildings come with a 5-year warranty on workmanship. 8’ wide buildings come with 46” single door. 10’ & wider buildings come with 72” double doors. 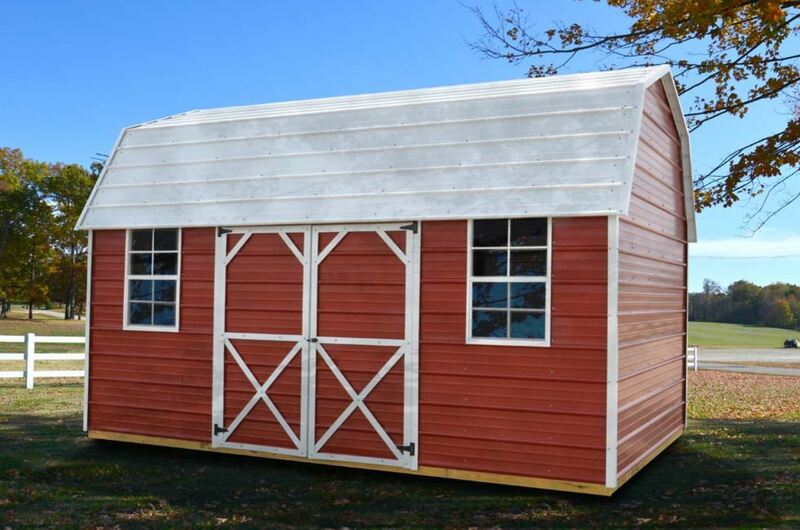 We guarantee our metal barns, carports, and portable buildings with a 5-year workmanship warranty. 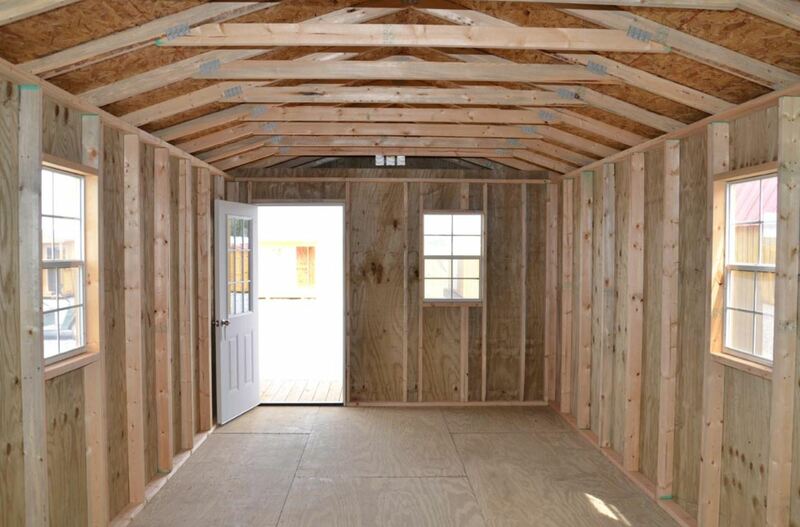 This means you can expect your portable buildings and carport kits to be free from defects in materials and workmanship, such as a leak in the roof, unfastening of trim or siding, and breaking of door locks and hinges. Derksen Quality! All exposed pressure treated lumber, and other pressure treated material on painted and metal buildings comes with a lifetime limited warranty to the purchaser only. This covers termites and fungal decay. Roofing including both shingled and metal roofs has a limited 30-year warranty. 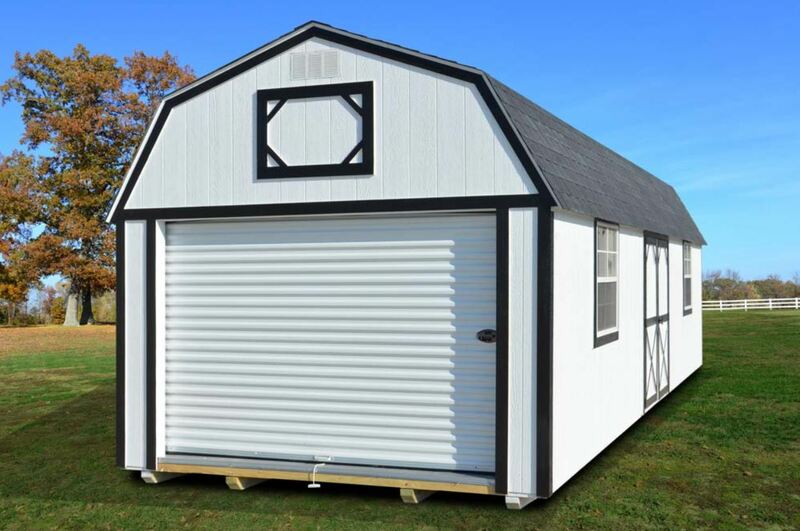 All metal buildings are constructed of 29 gauge roll-formed metal sheeting with 20-year paint and rust through warranty. Rent to own was established as an alternative to commercial storage. The low monthly rental rates are comparable to commercial storage rates per square foot; however, our Rent-to-Own program allows you to have your storage facility in your own backyard. All that is required for delivery of your building is the first month’s rent. You are not required to fill out a credit application, nor are you required to keep the building. Please ask your local dealer for details on our rent-to-own plan, or call our main office at 866-558-0203. Contact us for metal garages in Baton Rouge and Denham Springs. For pricing in your area, please call or text (225) 572-3691. Buildings at the sales lot can usually be delivered within 7 week days (weather permitting). No site preparation necessary (if site is accessible with truck and trailer and site is no more than 3 feet out of level).